If there was a theme this month it was sequined, cozy, and shoes! I finally found some black OTK boots I like. It only took 3 tries! I got a couple of questions about that when I mentioned I was having some difficulty last month. And the reason is that I am fairly picky about some clothing items. For black boots, I decided I wanted a certain style, height, and material. I also had a price point in mind I didn't want to go over. So it took a few tries to get it right, particularly the style and material. I really like suede and leather because they wear so nicely over time and last longer, but it was hard for me to find that. My new boots are really comfortable and worth the trouble! I put in a big order to thredUP when they had a 15% off sale and got a bunch of fun items for no real reason whatsoever other than they caught my eye. I have had credits with them from a collaboration I did with them a couple years ago and from selling some things to them and I haven't spent it all yet. When you buy things on sale, credits can last a long time! I can't wait to wear some of those sequined items though! For next month I need to look at some olive pants. I am finally right about back to my typical size so I'd like to take advantage of year end sales and find a nice pair. I love my burgundy coat so much I am thinking about a grey one and I would like a black crossbody bag. The berry/plum color one I have has been so useful with freeing my hands for a diaper bag and baby carrier I need another option that is more neutral. I was also wondering if I should continue to do these posts. I have done them for years, but they don't seem to get as many comments or clicks. Do you find them interesting? Is there anything I should change about them in order to make them more useful or beneficial? Please let me know! I am always looking to improve my content! Hope you are having a great week! I'm enjoying that quiet lazy period between Christmas and New Years and relaxing a bit. 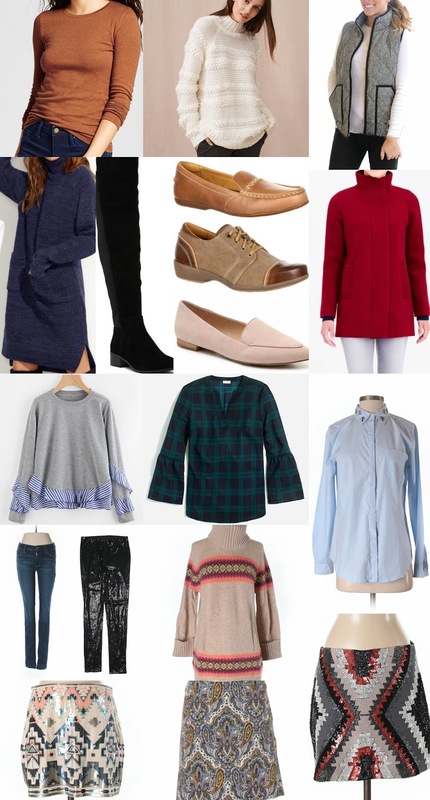 You definitely got some great holiday pieces! I love that burgundy coat. I've been itching for a new coat lately. Love those skirts! I do love these posts. Such great pieces this months! Oh I love the color of that Target tee! I have one sweater in that color and have always wanted to add a couple of other pieces. I do enjoy these posts, but it's very interesting that you feel engagement has dropped with them. It's easy for us to say "keep doing them" because we just get to look, but I am sure they are very time consuming! Personally that alone would make me change the way I do things (investing a lot of time but not seeing what I want in return) but go with your instincts...or the majority vote! LOL. It's always interesting to see your monthly budget since you are such a wise shopper, I am inspired! I should really spend more time browsing on Thredup, I sold a few things once and wasn't that impressed with how much I made and the fact that they paid me with a debit card (I've yet to use) but I keep seeing cute pieces bloggers are finding. My favorite piece here is the blue and green plaid top from JCF - love it! I love that vest and those sweaters, so pretty. And I feel like they would be amazing to add to my collection. The black jeans look really like a fun pair to have! I always like budget posts, even if I only do them for my own benefit! You got a lot of great pieces this month, and I've been looking for the perfect rust orange sweater myself, maybe I should see if target has one! You picked up some good pieces this month. I like to see other people's budget posts. I love the sequin leggings. You're so good about keeping a budget, Laura! I need some help in that department!! And I'm so glad you found some OTK boots that you liked---I bet you'll wear them a ton!! I know I have to work hard to wear my other shoes now...ha ha!! I like to read these! But I find myself often not commenting on these kind of posts. Don't know why not though! AHHHH, so much cuteness but those sequin skirts have my eyes bugging out of my head...absolutely LOVE!!! Wow that's a bargain for so many cool pieces! Thanks for linking up to Top of the World Style. I wish you and your loved ones a happy New Year. I always enjoy these posts! I just got my first pair of OTK boots and I went with a low heel as well... I'm excited to see you style them! I love that pair of sequin pants and still loving that ruffle sweatshirt from one of your previous posts. These are some serious steals, online shopping starting...now! Have a wonderful New Year's! How fun that one of your central themes this month was sequins. Atta girl!! Love that you used thred up credits to buy some fun items that just caught your eye. I am really, really, really wanting a tulle skirt but keep thinking I am too old to wear one. If I could find a free one...ha!...or a really inexpensive one, I would get it anyway!! Loving all the coats on your picks dear. That red coat is sooo pretty. Loving the vibrant color. That grey vest is really pretty too. Thanks for sharing dear. I love reading shopping recaps because I do them too. In my case I do them to keep track of my expenses.